Rhys and Angela Morrell are country people at heart, both born and raised in Horsham, Victoria. They were married in 2009, while Rhys was working as a nurse and Angela in banking, and have since been blessed with two children, Hannah (2013) and Ruben (2016). For many years, Rhys and Angela had a desire to dedicate their lives to serving God in some sort of full time ministry. 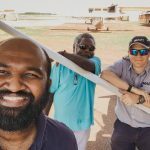 When the Australian Centre for Mission Aviation (ACMA) visited their church in 2010, they felt a conviction to be a part of the work MAF does in bringing ‘Hope to the remote’. This lead to Rhys completing a year of Bible College as part of a Diploma in Mission Aviation to become a commercial pilot. Rhys and Angela began working with MAF in Arnhem Land mid-2014. 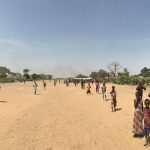 After living in the remote community of Ramingining for about a year, they are now settled in Nhulunbuy on the Gove Peninsula. Their heart’s desire is to minister to people in practical ways, showing God’s love wherever He may take them. Thank you for your prayers and support, which enable us to serve the people of Arnhem Land. But my life is worth nothing to me unless I use it for finishing the work assigned me by the Lord Jesus - the work of telling others the Good News about the wonderful grace of God.